The new MS MKII Series studio reference monitor stands from Ultimate Support offer unparalleled innovation and strength for professional, project, and home studios alike. 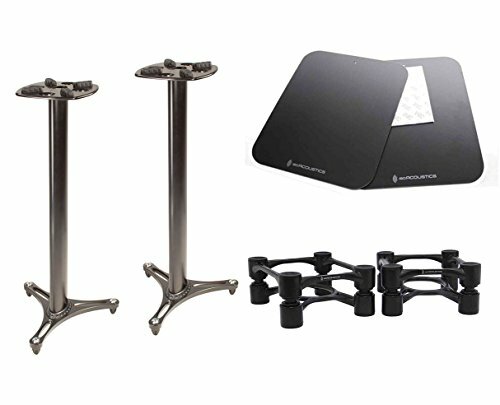 The MS-80 is a desktop monitor stand that features non-slip, high-density acoustic foam and an angle-adjustable base that allows the end user to fine tune the sweet spot. The MS-90 is a column monitor stand that offers internal cable management channels and 6000 Series aluminum construction while the MS-100 is essentially a combination of the two. Aperta, the stylish and sleek new line of sculpted aluminum acoustic isolation stands designed for medium-sized professional studio monitors and speakers. Aperta, the Italian word for “open,” describes the stands’ stylized design that creates open space and compliments its surroundings, as well as the spatial openness in sound and the crystal clarity in music that they deliver.